I don’t know much about Ithaca’s history in general, and I suspect it won’t be easy to track down the history of one tiny neighborhood whose boundaries are fairly arbitrary. Fortunately, there are a lot of resources at my disposal. The Tompkins County Public Library has an amazing collection of digitized books on this area’s history. I like research I can do from home. I’ve given Ithaca and Its Past: The History and Architecture of the Downtown by Daniel R. Snodderly a quick read, but much of it is set up as a walking tour and I never left my house with it. It’s filled with a lot of detail about individual homes in the city, though, so there’s a good chance some of them are found in Lower Northside. I’ll be going through it again looking for relevant street names. 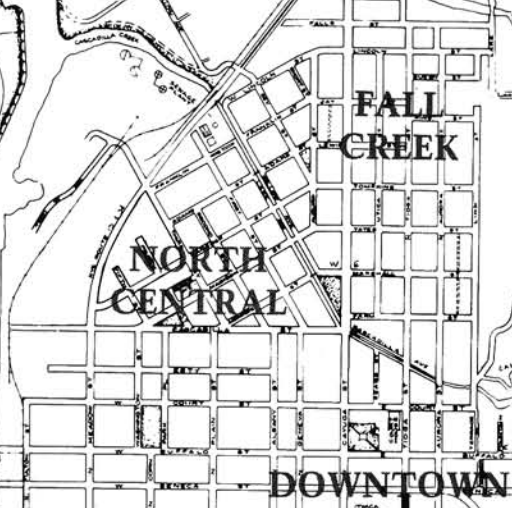 In this chapter the area south of Cascadilla Street and east of Washington Park will be referred to as Central, while the area west of Washington Park will be called West End. The area north of Cascadilla Street will be described as Northside. So this establishes Cascadilla Street as a meaningful border, but the West End described in the book (bounded on the West by what’s now called Fulton Street) is a little different from the one today, which includes the area around the inlet (here’s where I think City-data.com is way off, since they merge Northside and parts of the city that are commonly referred to as West End into something called Northside Triangle Inlet Island; again, many neighborhood borders are quite arbitrary). Northside is still Northside for the most part. It looks like Central is approximately what we now call Lower Northside, except the modern variant includes Washington Park. I’ll be diving into the details of the Central neighborhood in a later post. Both of these books were published by The DeWitt Historical Society of Tompkins County, now The History Center in Tompkins County (at least I think so; the history page seems to indicate they underwent a name change). I need to visit at some point. Another vital stop is Historic Ithaca, an organization dedicated to preserving and enhancing historic buildings and neighborhoods in the city. I don’t have a whole lot of free time and I’m sickeningly far from being a historian. I’ll be learning very slowly and I’m probably going to screw things up a lot. Worst of all, I’m not much of a writer. Still, this seems like a small way I can contribute to the neighborhood. Feel free to help me along the way.